Our handyman services extend across the whole of Greater Manchester but we are located and operate from Rochdale in North Manchester. We offer our full range of handyman services to home owners and businesses across Rochdale including Norden, Bamford, Whitworth, Castleton, Littleborough and Shawclough. 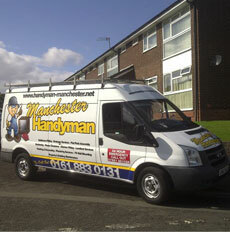 Which ever of our handyman services you after whether it is flat pack furniture assembly, kitchen or bathroom repairs, and odd job here or there such as curtain rails, blinds, new flooring, house, shed or garage clearances, even clearing out your back yard or garden Manchester Handyman is here to help. Rochdale handyman/Manchester handyman are specialists in cat flap fitting and dog flap fitting in UPVC doors double glazed units and brick walls. Our fitters give honest and cost effective advice within every field of catflap fitting/ dogflap fitting. We can provide any specific cat flap you require at cost price. This means that you only have to pay a labour charge. Kitchen cupboard door replacement, worktop replacements, fittings of laminate flooring, tiling, putting up shelves, installing cat flaps, installing shower trays and bathroom suites including toilets sinks and bidets, we have also carried out lots of outside work including painting of doors and window frames, painting of stonework, garage doors, cat flap fitting, gates, fences and decking. We have carried out lots of shed and garage clearances as well as garden tidying and maintenance. If you are interested in any of the services above, whether you are in Rochdale or elsewhere in the greater Manchester area then we are happy to pop round and give you a fixed price quote for the handyman work you want doing.